Chi le ma? is the most common greeting in China, but it doesn’t mean hello. Rather, it means, “Have you eaten?” To say that food is an important part of Chinese culture is an understatement. Chinese food differs regionally and seasonally. Wheat flour is a fundamental ingredient in northern cuisine, so dishes tend to include plenty of noodle or dumpling dishes. Rich ingredients and sticky sauces are also common. In contrast, food in the south is generally lighter in taste (largely due to the mild climate) and sauces and heavy spices don’t feature. Each province has their special own cuisine, too. The Sichuanese are well known for their hot and spicy offerings the world over, while seafood is an important ingredient in Shandong cuisine. It’s safe to say you won’t go hungry in China. Here, five must-try dishes on your China adventure. Jiaozi are most commonly eaten in Beijing and provinces in the north, but these delicious morsels can be found everywhere. Jiaozi has a fascinating history dating back to the Eastern Han dynasty. Legend says a man named Zhang Zhongjing was concerned about frostbite during the harsh winters (a common feature in the north). To combat the ailment, Zhang made small parcels of mutton and medicinal herbs, wrapped them in a dough, shaped them like ears — as these were the most frostbite-prone areas on the body — and boiled them. He then gave them to the villagers in the hope they would warm up and improve their circulation. 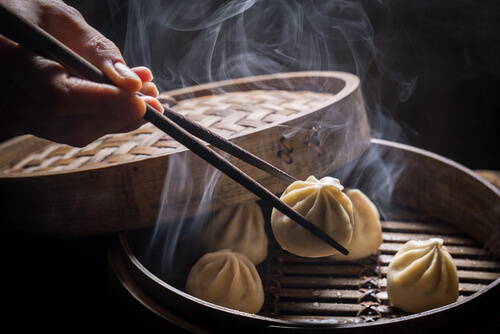 Frost-bite aside, today, jiaozi hold a special place in national celebrations. During Spring Festival (Chinese New Year), families sit around a table, catch up on the past year, and make jiaozi together. A coin is placed in just one jiaozi, and the lucky recipient is said to expect good health and fortune in the new year ahead. Hailing from Sichuan, mapo dofu, is a beloved comfort dish which is usually eaten with steamed rice. The most common version of the dish, said to be over a century old, incorporates fresh silken tofu marinated in a spicy Sichuan pepper sauce and topped with minced pork or beef. The name ‘Mapo’ is an homage to its creator, Chen Mapo, a restaurant owner from Sichuan’s capital, Chengdu. Chen used the principles of Sichuan cooking to transform a simple ingredient like tofu into a rich dish bursting with spices and flavour. Chen served a version of the dish to labourers who would crave a hearty meal after a hard day’s work. As the dish grew in popularity, Chen added pork, elevating its already complex flavour to another level. 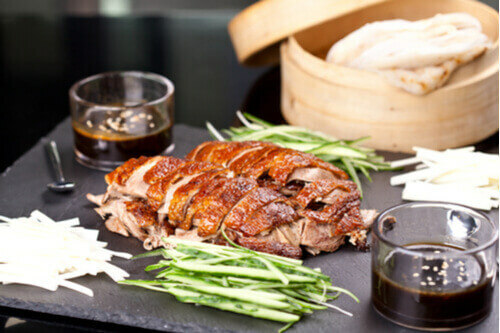 Beijing kao ya (Peking duck) features slices of crispy, roasted duck with lashings of sticky hoisin sauce, wrapped in a thin pancake and garnished with spring onion. It’s decadent, yet light, sweet, yet sticky – a delightful culinary contradiction. The infamous dish has roots in northern China and dates back 600 years. In the Ming dynasty, people used to travel from all over the country to cook for the Emperor. This illustrious position was only granted to the best chefs and resulted in the creation of many exquisite dishes, including Beijing kao ya. 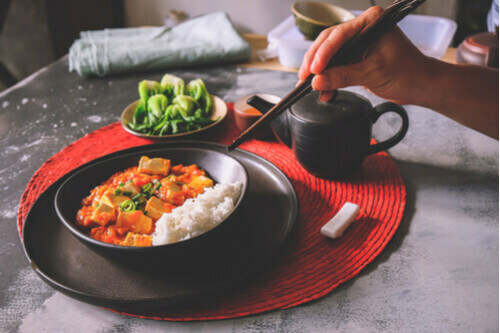 When the final empire of Ching fell in the early 20th century, chefs once employed by the dynasty brought their favourite recipes to the streets of China and Beijing kao ya became a sensation. 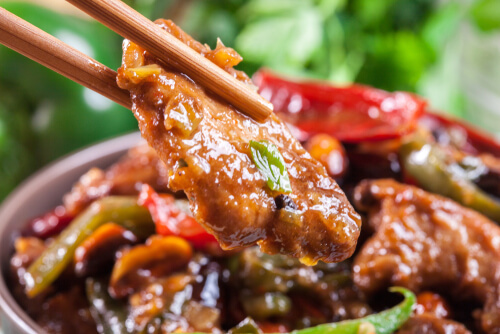 Gong bao ji ding (gong bao chicken) is a fixture on western Chinese menus around the world, but unlike some dishes, it remains quite traditional. Its origin can be traced back to the southern province of Guizhou and a clumsy fellow named Ding Baozhen who fell into a river. Ding would have drowned if not for a local man who dived in to save him. Years passed and the two men lost contact until Ding tracked him down and prepared a special meal as a way to show his gratitude. The dish, featuring marinated chicken, peanuts and fiery Sichuan peppercorns, was so delicious that the man asked Ding for the recipe. Gong bao ji ding became a local restaurant fixture and eventually crossed the seas to the west. Today, modern iterations tend to include cucumber but whatever the ingredients, this Sichuanese dish always packs a punch and remains as popular as ever. 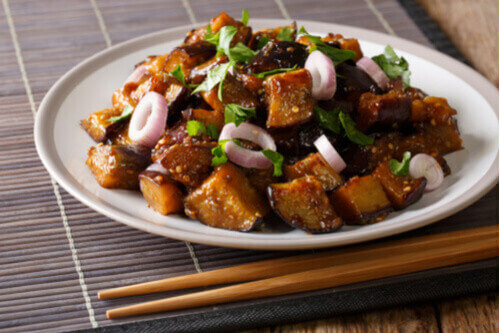 Ubiquitous around China, yu xiang qiezi (fish-fragrant eggplant) is a flavourful Sichuanese eggplant dish which is usually served as part of a banquet. The dish doesn’t contain fish, and yu xiang (fish-fragrant) refers to the tasty sauce which is traditionally found in Sichuanese fish dishes. Generations ago, when vegetables were far more accessible than meat and fish, ingredients like eggplant were used as replacement proteins. Yu xiang qiezi follows this technique - the flavours are sweet, sour and spicy, rather than the typically intense heat associated with Sichuan-style food. As for those mouth-numbing, lip-curling spices? Those are Sichuan peppercorns. If you see ma la on a menu – ma la hotpot, ma la tofu – you can expect to walk away with a tingly tongue and numb lips.